This Christmas, we laid down the law. No waking us up until 5:00 a.m. And, yes, that seems like we are being generous and letting her get us up early, but that is nothing compared to how early she would do it if we didn't set parameters. She followed directions like a champ, but she did tell us that she woke up at 2:00 a.m. and played iPad until 5:00 came around. This is her first year not really believing in Santa, so we tried to make it extra special and added a few cute things like a toy she really wanted and thought there was no way she would get it. Dale wrote a beautiful letter from Santa about the magic of Christmas and left the BB8 robot from Star Wars on her bed. The letter told her to go upstairs to find one more present, and she loved it. Most unfortunately, our normally fabulous Saudi weather turned into an atypical day of rain akin to something out of Seattle, so she didn't have a chance to go outside and play with toys. We did, however, take advantage of our local golf club and partake of their turkey dinner for lunch, mostly so I didn't have to cook before heading out of the country tonight. Sojo went to lunch dressed as she is in the above photo: highwater pajama pants, an old tshirt and a flannel put on top. The helmet was worn most of the day, but she took it off for the lunch trip. She's a classy one. Off to Chamonix tonight to meet up with the entire side of my family. Hate the journey, love the destination! Our first camping of the year was very close to home. About five minutes drive, to be exact. We generally head out to a dune area about 30 minutes away, but there have been a few instances of locals not being keen on foreigners camping, so we decided to spend the night right on our own camp. Once we got over the bummer of not being able to climb the dunes, it was just fine. The kids made their own fun by climbing the rocky hills and playing with fire for hours. Since many of the kids are Minecraft fans, they found a bunch of metal rods in the desert and spent an inordinate amount of time trying to melt the metal to turn it into swords. We told ourselves to remember that camping in the middle of November is the most perfect time of year: not too cold, but cold enough to bundle up and enjoy a fire. The next morning, I brought out my super-cool, propane coffeemaker, (my luxury camping item) and it was a big hit with the adults. As the adults enjoyed coffee, I snapped this photo of the kids up on a hill, and the early morning light combined with the pretend play were downright magical. Most of us who live here in Saudi are so grateful that our kids are growing up with such an innocent, safe childhood. The only downside I hear folks with older kids say is that the kids are not as savvy about the 'real world' because it's so accepting and so safe here. I can take that downside if it means our kid gets the chance to grow up with such amazing experiences. After a long blog hiatus, we are back! Moving into the winter season in Saudi is always our favorite time of the year as it's the time when we can forgive the incessant heat of the summer. 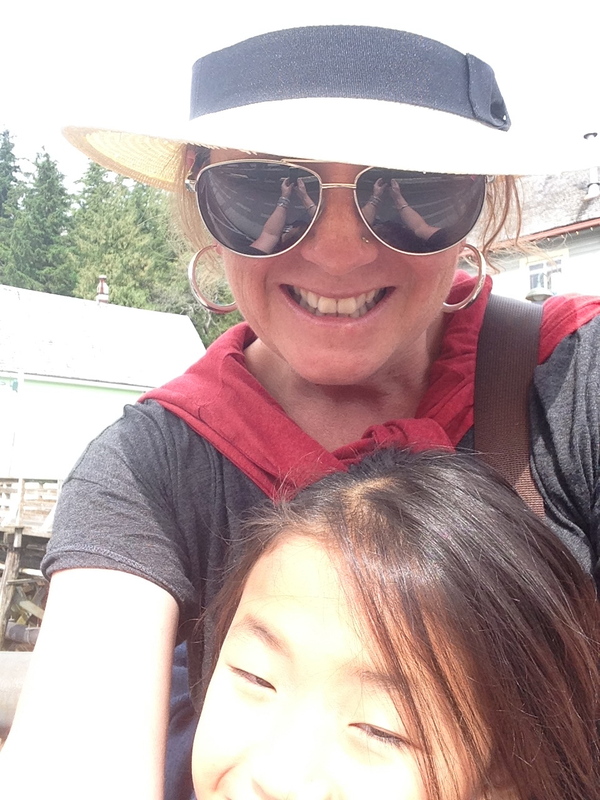 Our vacation has begun, but we will stay here for one week working while Sojo has various middle school babysitters. 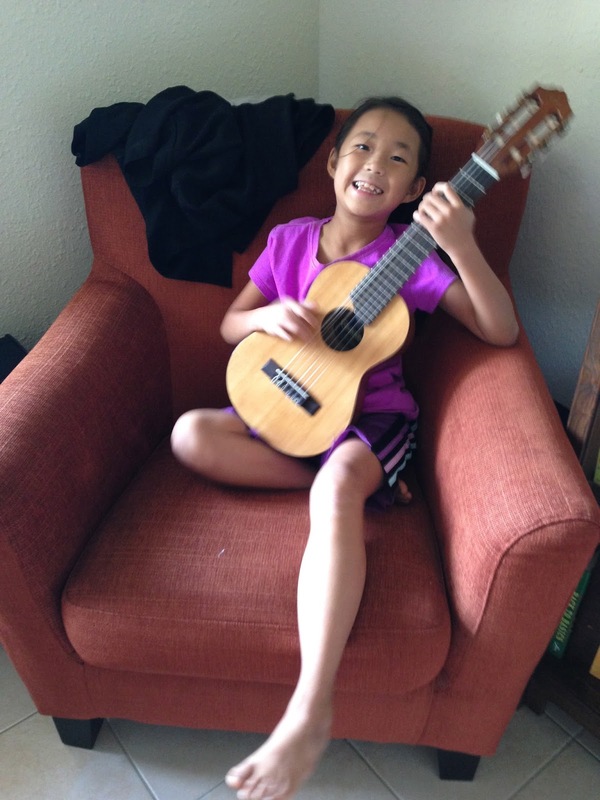 Sojo especially likes being here for Christmas, and it gives us teachers a chance to rest after a long stretch. After we celebrate here in Saudi, we are off to the French Alps town of Chamonix with my entire family. Can't wait! Throughout the years here, Bahrain is where we go when we need a little getaway from tiny-town living. We headed there a few weekends ago to soak up the sun and see a few movies. Unfortunately, Sojo was getting sick, so we spent a lot of time chillin' in the hotel room. Fortunately, we are a family that loves to hang out in hotel rooms. And this one had a beautiful view. 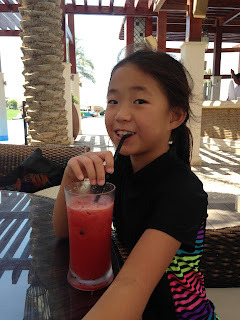 There were killer sunsets, a glorious evening swim, and our beloved watermelon juice. 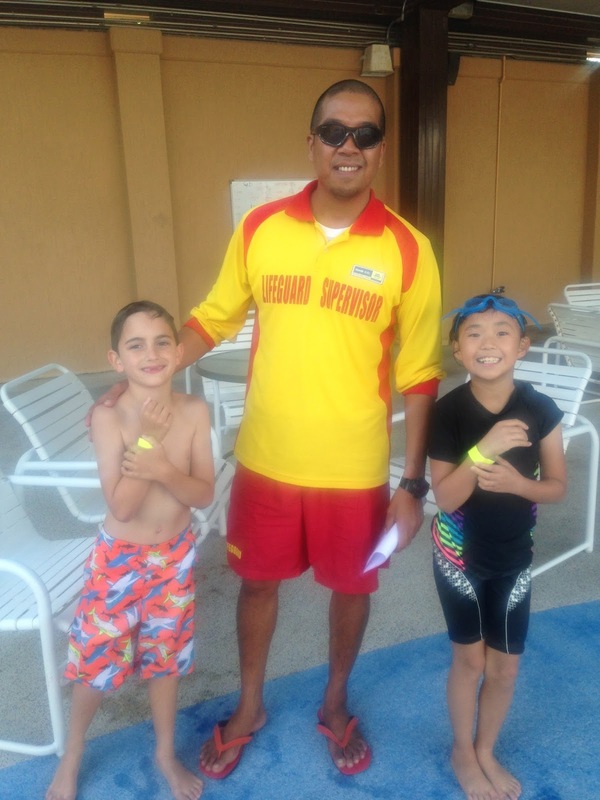 For months now, Sojo and her friend Eamon have wanted to take their official swim test at the community pool. Passing the test would give them the chance to be a bit more independent and would not require that an adult is physically in the water with them. Dale and I are not ready to send her off by herself to the pool quite yet, but getting the swim card was still a big deal and both were pretty nervous about the test. Thankfully, they both rocked it. The trickiest part was the treading water, so the dads both jumped in and did it with them for moral support. As a mama, I was totally impressed with their strength and perseverance. 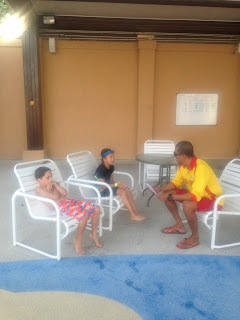 The final part of the test was an interview with the lifeguards where they had to answer safety questions. You know you're living in a small town when all the lifeguards erupt in applause for the kiddos when they finished. They all call her Jojo instead of Sojo, so that was even sweeter to hear cheers for Jojo. My only job was to get the food ready: steak, homemade pizza and a last minute realization that our little cafe down the road sells Shirley Temples, her favorite summer discovery. All three girls had a blast at what they called the banquet. As Sojo said, "I've never had a banquet before." After dinner, they danced and giggled and had a great time. Every now and then, Dale and I would peek in and then gush to each other about what a beautiful soul she is. So, so fortunate. 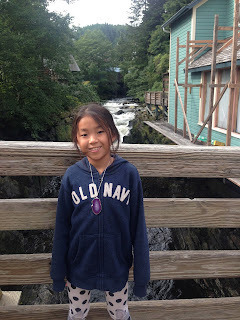 My favorite of our three stops was the city of Ketchikan. Small enough to be quaint, but big enough to have a few things to do, it was a great place to spend the day. 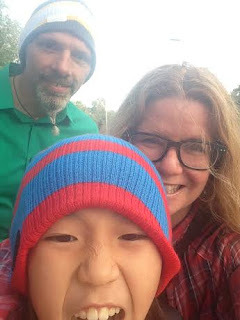 We chose to see a lumberjack show as we thought the kids would get a kick out of that, and they absolutely did. It was so cool to see them showing their strength and doing typical Alaskan things like using a chainsaw and climbing poles. I had no idea, before going to Alaska, how much of an Alaska culture there is. We then walked around Creek Street and looked at all the beautiful rocks and geodes and such for sale. 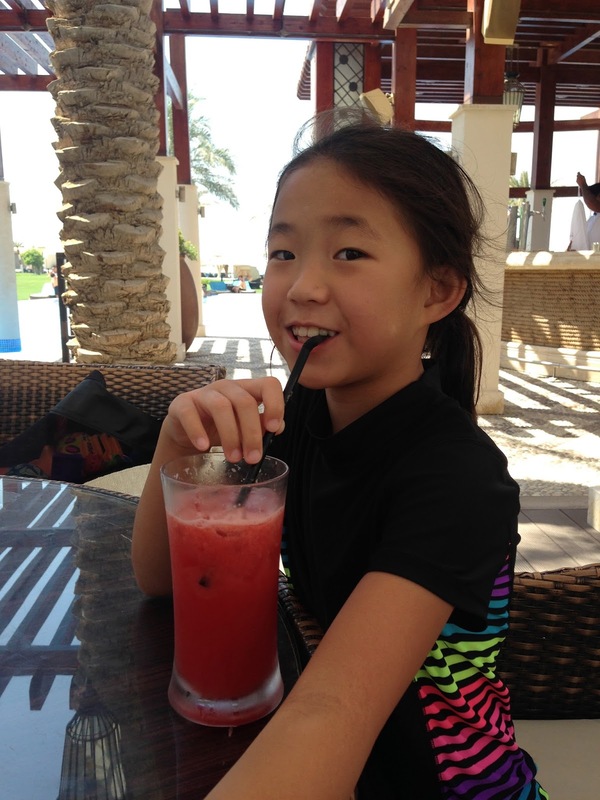 Sojo loves any sort of gem, so she bought an agate that later became her good luck charm for the first day of school in Saudi. The best part of Ketchikan for me does not have a photo to go with it, and that was when we saw a black bear in a stream eating a salmon. This was on my Alaskan bucket list (that and Northern Lights, but this isn't the area for that), and we took a trolley tour out to an area known for bears. The salmon were on their run, and so they were everywhere. To our delight, we watched not one but TWO black bears catching salmon, and it was just as cool as I thought it would be. 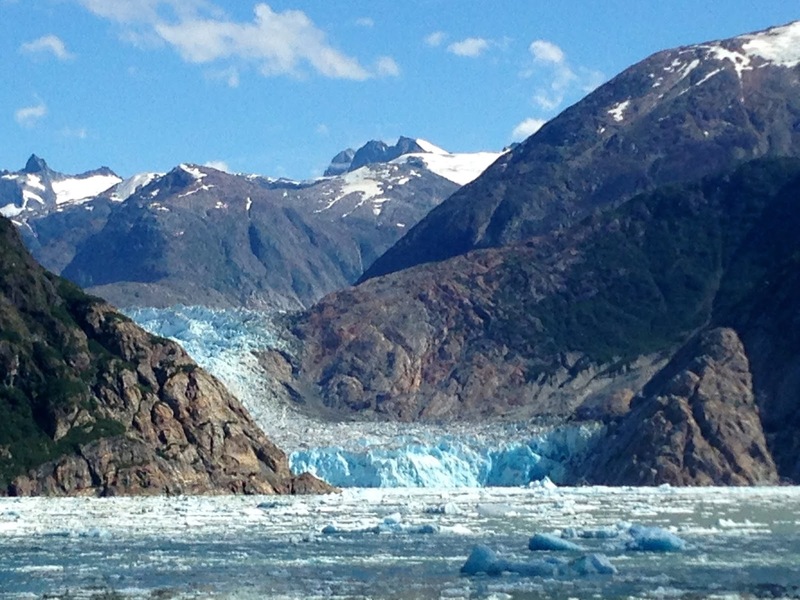 One of the highlights of the cruise for the grownups was seeing Tracy Arm, Alaska, and the gorgeous glacier tucked in that area. We took hours to move slowly through the narrow passage, and seeing the first iceberg chunks in the water was so exciting. As we got closer, their number increased until we were in full sight of the glacier. Spectacular. 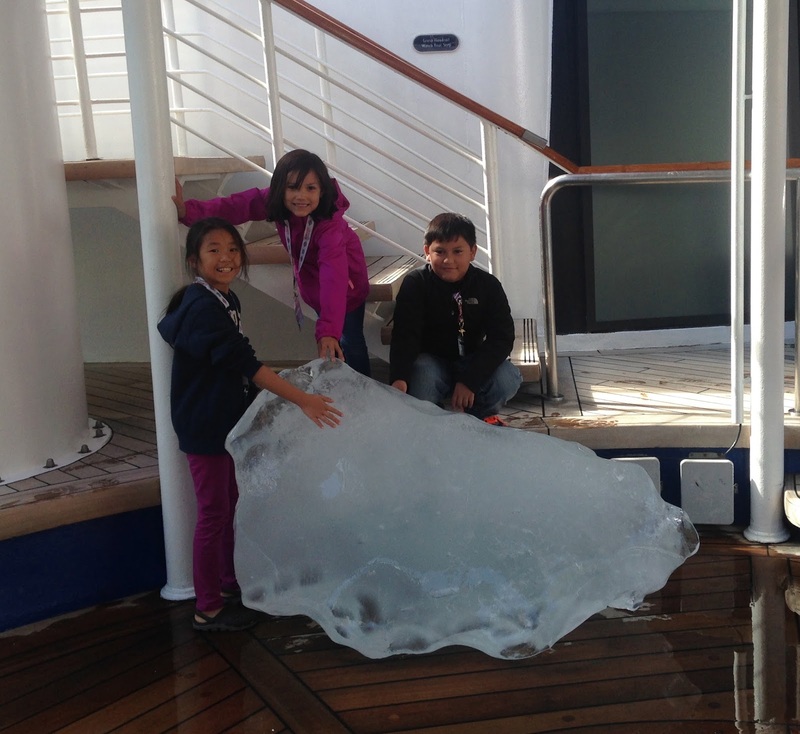 The captain of our ship, Captain Fabian, was so incredibly personable, and we were told that he always lowers a metal basket over the side of the ship to 'catch' a piece of ice so the kids can have a first-hand view of a piece of a glacier. Checking out the frozen air bubbles was so cool. I still miss Alaska and its beauty. 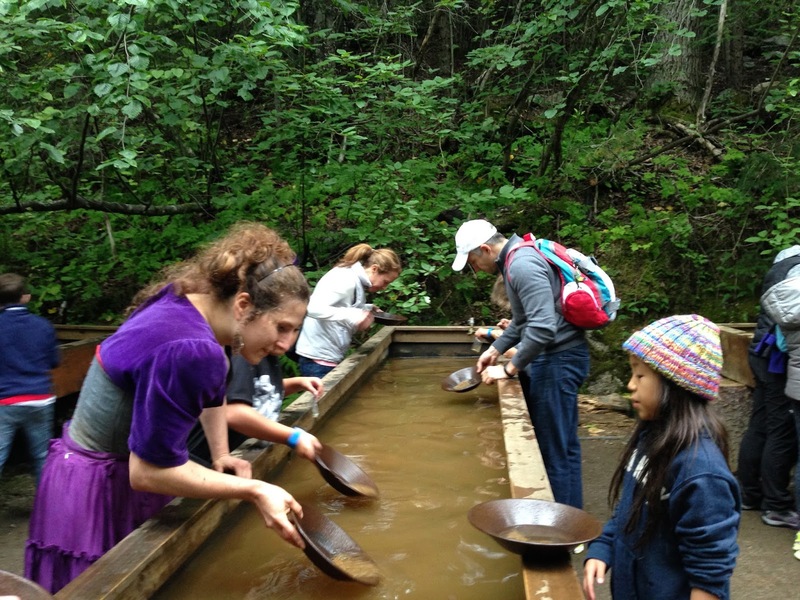 Our second half of the train trip in Skagway took us to a small operation for gold panning. It was a somewhat cheesy set-up of a mining town with locals dressed up and acting as hillbilly as could be. We all got pans and set to work finding gold flakes in the troughs, which was not an easy task. I was certain the kids would get frustrated quickly, but we wound up having to drag them out of there to get back on the bus and onto the boat. 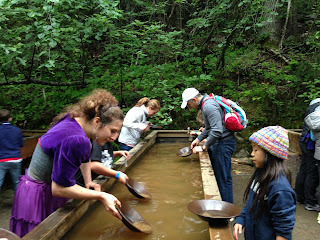 Our girl loves her gems, so having the chance to pan for gold was a big treat for her. Walking back to the boat gave us a chance to use the beautiful Alaskan wilderness to do some parkour training. Love that her look is so Alaskan. Our first port of call on the cruise was Skagway, Alaska. The town is tiny, even by Alaska standards, with about 860 people living there. 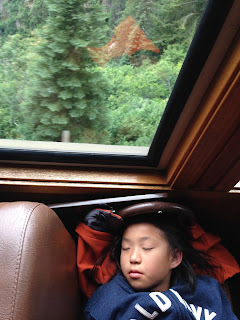 We booked an excursion to go on the White Pass railway, taking us on a beautiful train ride up the mountains into B.C. It was stunning, but Sojo didn't really have any thoughts about it at all. 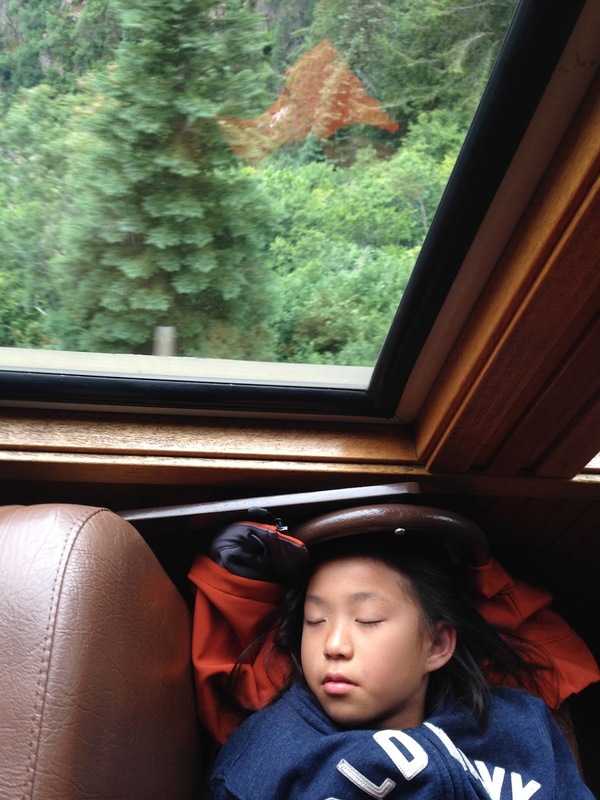 She slept the entire train ride, as per usual with trains and boats and her. The terrain was this sparsely beautiful tundra, and the town of Skagway was just what I pictured an Alaskan town to be. My love for Alaskan wilderness was growing by the second. 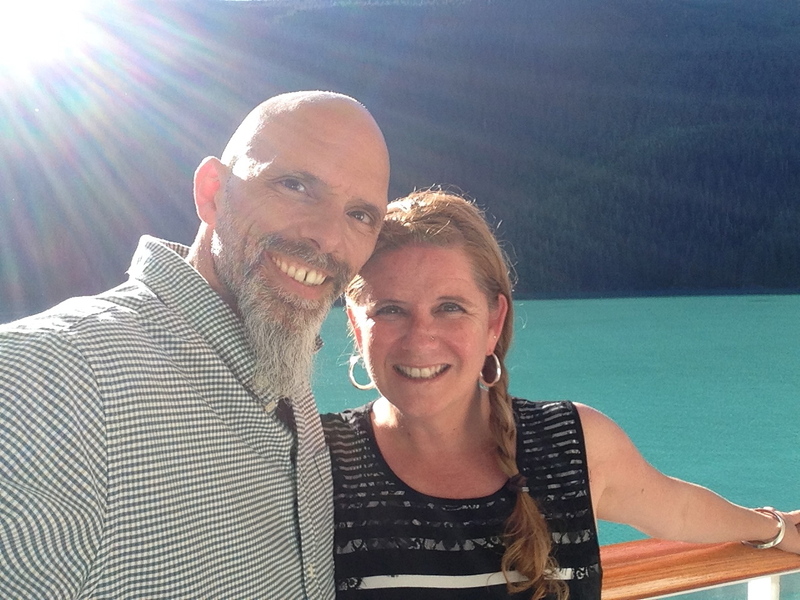 We were so fortunate to have sunny days during our entire trip, and Skagway was no exception. 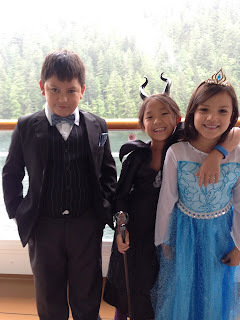 Our big adventure this summer was a cruise to Alaska with most of Dale's family. 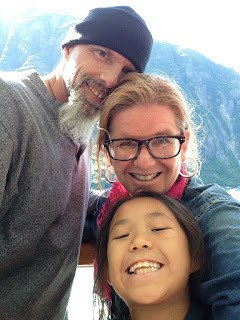 We chose Disney as it gave us tons of fun for the kids, and the adults got to soak in the absolute beauty that is Alaska. It was such an amazing trip for all of us. 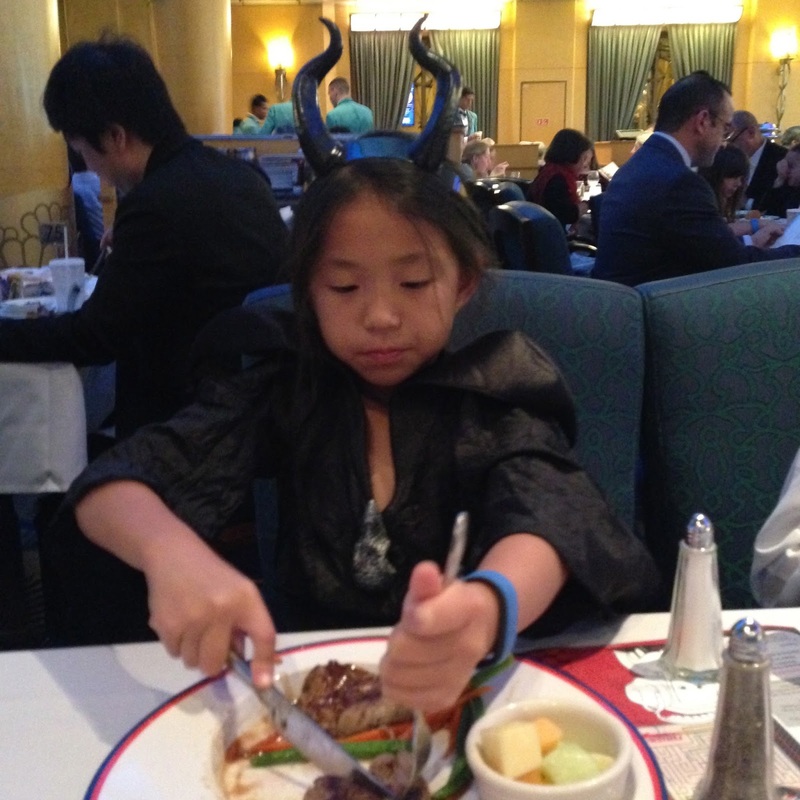 One of the many highlights was having the kids dress up for dinner. 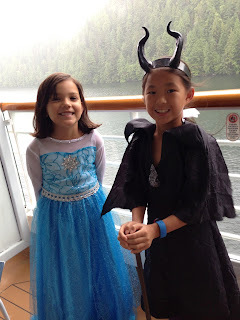 Sojo wanted a costume from Maleficent, so we grabbed one at a party store right before we left. She looked adorable, and it's been so long since she has worn a dress that she forgot how hard it is to move in one. We were spoiled rotten on the cruise with delicious meals and lovely servers who made everything feel extra special. Sojo discovered steak on this trip, and her very favorite was filet mignon! Seriously, how do you get back to real life after a week of that? Another new thing was Shirley Temples with her cousins. Steak and Shirley Temples were on the menu just about every night. We grown-ups ate like royalty as well, but it was hard to get us off our balcony with all that great scenery. Truly spectacular sights. We celebrated our ten-year anniversary this past week, and my brother hooked us up with a night at a fabulous dude ranch here in Tucson. It was absolutely stunning and nestled right into the mountains. The casita itself was exactly what Dale and I would love to live in--small but not too small and with tons of Mexican touches to it. Our M.O. is that we rarely give each other gifts, and we are both totally fine with that. Actually, it makes life easier in general, and if we find something cool during the year for each other, we buy it at the moment. However, I was walking around the casita and noticed a sign by the window about how to draw the curtains. I then noticed what looked like another sign on a ledge, and I went over to see it. Then, I saw Chama Linda, which is what Dale calls me (means pretty friend in Spanish, and we've used it for years--I call him Chamo Lindo). What on Earth!? It was our vows in a frame, which was incredibly sweet as we made three promises to each other ten years ago. Looking around, I saw tons of frames all over the room (sneaky guy put them up while I was in the shower), and our vows were translated into every language from all the countries we have lived in. He enlisted help from friends all over, and it was the best gift I could ask for. Those three promises were written slightly on the fly the morning of our wedding, but we meant them and still live those vows today. I couldn't ask for anything more. I promise to be your true companion wherever our journeys take us. I promise to continue supporting your growth as an individual and to trust in this leap of faith. Above all else, I promise to be your friend and, as such, to treat you with respect, kindness and love. Sojo just came to me and said that I needed to come out and take a photo of her. That type of request is not typical, so I knew it had to do with her new best friend, Shadow. Even with all the health improvements with Sojo, the allergies to dogs and cats remains an issue. And this kid really wants a dog in the worst way. We have experimented with hypoallergenic dogs, and, most unfortunately, they also cause a reaction for her. However, we saw this Zoomer robot dog at Target the other day, and Sojo fell in love with the possibility of having a dog that acted like a dog but isn't real. She charged him up and spent most of the day playing with him. He responds to 60 voice commands (her favorites so far are "play with me" and "I love you"), and he is downright adorable. She is totally in love. For this reason, she called me out to take a photo of him watching TV with her. We are just curious about the towel under him. Worried about an accident? For us, that is the best part of having a dog like this--all the fun without the early morning walks and poop pickup. When we adopted Sojo eight years ago, we were given this beautiful baby girl. And a tube of steroid. We were told she had some eczema on the back of her neck. Little did we know that there was so much more lurking. We put socks on her hands the very first night together, and she did not sleep without socks on her hands until she was almost six years old. This picture is of Sojo when she was with us about a week, and the eczema was already getting way out of control. The rashes and reactions worsened over the years, and we were at a loss of how to help her. While in the throes of some dark, dark times with eczema itching, pain from so many open sores and no sleep for anyone, I spent hours and hours scanning the internet for solutions. We tried everything anyone suggested to alleviate her itching--bag balm for cow teats, Cetaphil, coconut oil, everything. At one point, we went down the homeopathic route, and the concoction the doctor gave us caused huge clumps of Sojo's skin to fall off. Literally, when she got up from the couch during that period, there would be hunks of skin left. The doctor said she had only seen that before in children living in the slums of Calcutta. Unfortunately, all that skin falling off led to some horrible bacterial infections, so we went back to steroids. 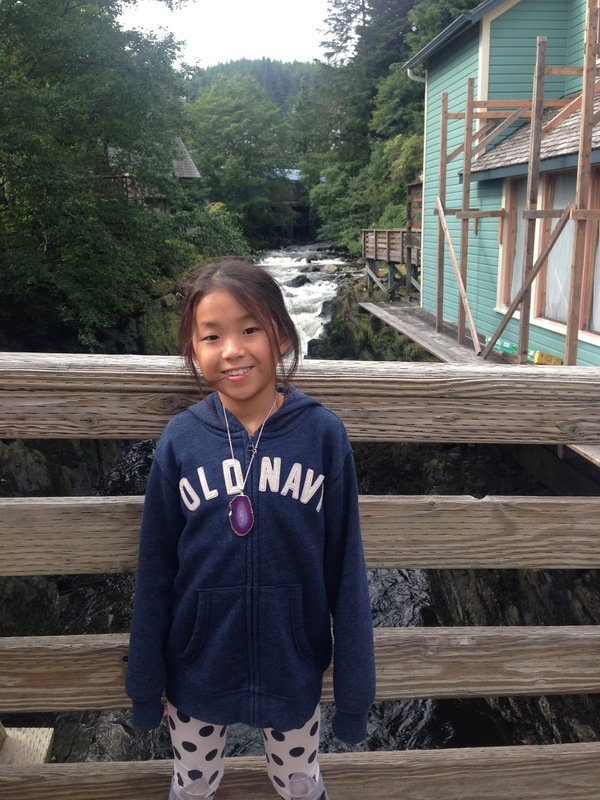 In a nutshell, her life (and our lives--it is incredibly hard to watch your kid suffer so much) was pretty challenging for about the first five years of her life. Yet, here we are, 3 years into a fairly healthy, just-about-eczema-free life with Sojo, and I thought I would share some of the ways that we help her stay healthy, just in case there is a mama like me out there scouring the web for some peace. Oh, and my husband and I have actually slept through the night for more than 3 years now, something we simply thought would never happen. We still marvel at that. I also marvel that when I grab my daughter's hand or touch her arm, the skin is soft and not like that of a crocodile. 1. I now believe that the bulk of the eczema comes from food reactions, and our pediatric allergist years ago swore that all eczema is food-related, but we resisted against that for years. And, although Sojo has been allergy tested like crazy, some foods that should be okay cause a reaction. My craziest example is marshmallows. There is absolutely no ingredient in the random US brands of marshmallows that should cause any skin reaction, yet every time she eats one, she has an eczema outbreak for more than a week. Obviously, we never eat them as that is not fun for her. Strangely enough, there is one Asian brand at our store that has marshmallows that don't cause a reaction, so those are the ones we eat. Trial and error seems to be a biggie for foods and eczema. Plus, making your own marshmallows is kind of a pain. This has happened to us with various foods. Making pesto with that artificial Parmesan cheese is fine, but there is an instant reaction to real parmesan cheese. McDonald's vanilla ice cream cone works fine, but Dairy Queen's causes an instant reaction. 2. Climate helps. When we lived in Bangkok, Sojo was downright miserable as the humidity and sweating made the eczema worse. Plus, she had to wear long sleeves and long pants due to scratching, so she was not very comfortable. Moving to the dry, dry desert of Saudi was nothing short of miraculous, and we saw an almost instant, positive change. That being said, we have friends here whose son struggles in the dry and does better in humidity. It's worth a try to see if a vacation to a different climate causes a change. 3. Allergy testing doesn't really seem to mean much. Sojo has been tested different ways, and although the tests show that she has only a tiny allergy to soy, she tends to react to it. She isn't allergic to eggs, and she can eat them baked in something, but when she eats a scrambled egg, she has a reaction. Again, because of the trial and error, we eliminate certain brands and certain foods. Even with ice cream--we'll try a brand to see if it causes a reaction. Some do, some don't. I don't know the difference, but we stick with what we know works. And then we panic when that brand is out in our tiny town. 4. Sometimes, we let her try a new food to see if there is a reaction, and it seems fine. However, she tends to get way too excited about a new food and eats tons of it, which sometimes causes a reaction. We have adjusted in letting her have certain things every now and then instead of on a regular basis as we find that eczema occurs more when there is a bit of a build-up of something in her system. 4. Using steroid to battle the reactions does help. Maybe it's because we are living overseas, but the doctors here in Saudi and in Thailand always tell us how Americans freak out about steroid use more than they need to. When we need it, we use it, and not just a dab like I used to because it made me worried. When there is a reaction, we need to get it right away so it doesn't go out of control. 5. I swear we've tried them all, and, like I said before, we never minded if people suggested something new to us. Eczema is one of those things that everyone seems to know someone who had success with something. Our big success has been Aquaphor lotion, and we lubed her up every single night for years. She is now older, and she hates how sticky it is and really doesn't like it on her, so we have found something new that is light and seems to work nicely: Neosporin eczema lotion. Pretty happy with that so far. 6. Sojo also has asthma, and just this year, we put her on a daily asthma/allergy pill. We think this is also working well for her. She would often get stuffed up right as she went to bed, and this has taken care of that. There you have it! I sincerely hope this helps someone out there with some strategies. Look at this girl now--wearing shorts, something we never thought could happen without tearing up her legs with itching. She's that healthy! We are in the midst of Ramadan here in Saudi, a time where everything moves at a slower pace, and it is against the law to even eat or drink in public. As a non-Muslim, we go about our days almost the same, but I think frequently of the many imported workers who are in the 117 degree heat with no food or water all day. It is definitely humbling. Last night, our dear, dear Malaysian friends invited a bunch of us to an Iftar meal--our first official Iftar (breaking of the fast) meal in our time here. Dale and I decided to go all-in and fast yesterday. While we didn't officially do the 3:00 breakfast before the sun comes up, we ate our own normal breakfast and fasted from food for the rest of the day. Seems simple enough. Let me just say that deprivation is not something I do well with. I was a wee bit worried. Whenever I got hungry yesterday, I reminded myself about one of the reasons people fast during Ramadan--to remind themselves that there are many people in this world that go hungry each and every day. That knowledge made fasting easier. Right at 6:38 p.m, the evening prayer time, everyone ate a date and had a glass of water, which is the way to end the fast each night. Then, we ate ourselves silly with so much food. The custom is dessert first (woo hoo! ), then the main course, then dessert again. Needless to say, we were stuffed. These two beauties always make me smile. They adore each other, and Sojo wore her Malaysian outfit to the Iftar as it is the only somewhat fancy thing she owns. It is actually pajamas in Malaysia, but she wore it as a dress, so her friend went and put on her pajamas as well. Nights like last night are an incredible gift. Our 8 year anniversary of being a family also coincided with Sojo finding out that Santa wasn't real, so we will always remember 'the day Santa died.' A middle schooler had told Sojo that the tooth fairy was not real, and so she asked us at bedtime if this was true. Dale and I both knew we were most likely on our last year of belief with Sojo, and we decided to tell her the truth because she had flat-out asked. The tooth fairy being us was a surprise, but not a huge deal. However, of course, that led to the "What about Santa? Is he real?" question. Even thought it was almost a month ago that we told her, every now and then, she'll just get this dejected look on her face and say, "There's no Santa." This is a kid who lives in the magic of life, and so this was a doozy for her. Just to make it up to her, I might need to pick up this ridiculous, 3 foot long gummy worm she saw online and was begging me to buy for her. At first, I said absolutely no way (it is truly so gross! ), but it might make a perfect Santa gift this year. 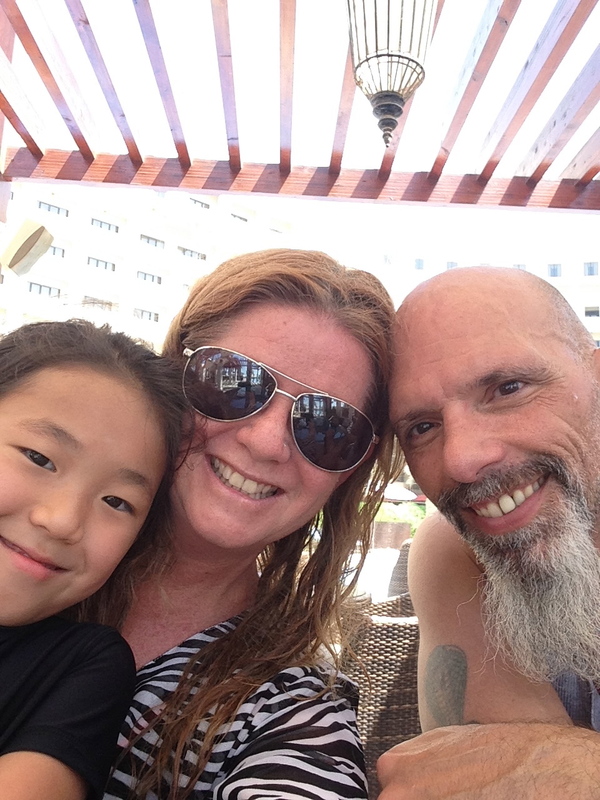 When we lived in Asia, it was very common to have kids running around in those bodysuit kind of swimming wear, and I loved how it protected her from the sun in super hot Bangkok. Her pink Angry Bird suit was her very favorite then, and she wore it until it was completely stretched out. I myself love the stripy, summery one-piece suits that remind me of my own childhood and look downright adorable on kids. I usually picked one up at Target each trip home to have on hand overseas, but she rarely wore them after the age of 3. As Sojo is growing older, she is more and more modest and is totally opposed to one-piece swimming suits. There was once a huge kerfuffle on a weekend trip when a one-piece was her only option, and she felt strongly that certain body parts were HANGING OUT for all the world to see. We had to convince her that nothing was hanging out, but she felt so uncomfortable that we had her go online with us afterwards to find a bathing suit that she felt more at home in. She chose a rash guard and boy shorts, and we thought we had found a solution of what was good for her comfort level. However, wouldn't you know that the boy shorts are pretty darn short and, again, parts are hanging out that she doesn't want hanging out. We lived with it this year as it was better than it was, but she still wasn't totally at ease. 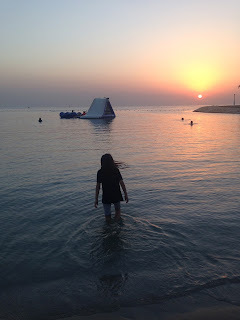 Then, we went to Bahrain a few weeks ago, and we saw a sport store with the very modest swimwear that is found here in the Middle East. The longer, to-the-knee shorts were perfect for her, and she was thrilled to give them a go at a recent Water Fun day on our compound. Watching her run around with such ease, and with absolutely nothing hanging out, was so wonderful to see as a mom. And she looks downright beautiful. Two ponytails and this type of outfit bring me back to my own childhood, and I couldn't resist taking a photo in front of our school. And the shorts. Those little legs sticking out of them are adorable. Dale and I both still can't believe that she is healthy enough to actually wear shorts. For years, with her eczema so horrible, shorts were out of the question as that much exposed skin would be too tempting to scratch to pieces. We are so happy for her that she now leads a more comfortable life, complete with wearing shorts. Almost done with 2nd grade, this girl. So exciting and beautiful to watch her growing up. 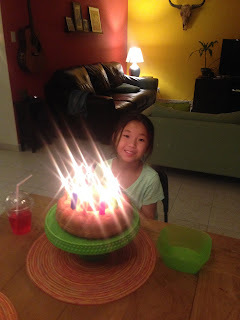 She is such a compassionate person, and we are proud to be her parents. Our school had a super cute Book Character parade for Reading Week, and Sojo dressed up as one of her favorites, Franny K. Stein. She's a girl mad scientist that is quite funny. An added bonus was that she got to carry a stuffed animal to school, something she wishes she could do each and every day. Last night, we had the biggest shamal we've seen since moving to Saudi. The wind whipped the sand around all night long, and it was like snow on the ground this morning. Sojo needed to have her eyes protected, so she wore these awesome glasses. And in a completely unrelated photo, I snapped this the other night of her reading in bed. Not something she chooses often (she always prefers that we read to her), but this Roscoe Riley book was so good that she finished it in one gulp. We love catching her looking so big. This spring break, we headed off to the glorious city of Paris yet again. Spoiled, yes, but we also wanted to take Dale's mom somewhere in Europe, and she chose Paris (woo hoo!). Dale's sisters met us there as well, so it was a true family affair. We rented a big flat with plenty of room, and we saw as much as we could see in the chilly 6 days. 1. Seeing the Eiffel Tower just as spring was starting to appear. Cherry blossoms were stunning! 2. Hop-on, hop-off bus was a blast, especially seeing Dale and his sisters so happy to be together. Next time, I want to go up the Arc de Triomphe as they said it was awesome. 3. We didn't visit the Louvre itself, but I loved just hanging around the area, drinking coffee and eating bread. So much bread was consumed on this trip. 4. We stayed in the Latin Quarter this time, and it had more of a local feel than the St. Germain area. I liked both for different reasons, but we hung out at a cafe on the Contrescarpe where Hemingway used to write. Cool factor very high there! Sojo was especially fond of the gelato store on Rue Mouffetard, and she partook of gelato at least once a day. 5. We made a day trip to Versailles, and it was a sight to see. Truthfully, the opulence was overwhelming if I took even a minute to think about it. 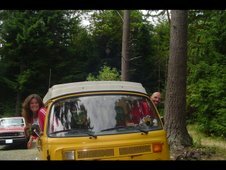 My favorite part was when we rented golf carts to toodle around the gardens, stopping to eat hot baked potatoes on the way. Even after two times in Paris, I'd hop on a plane to go back in a heartbeat. 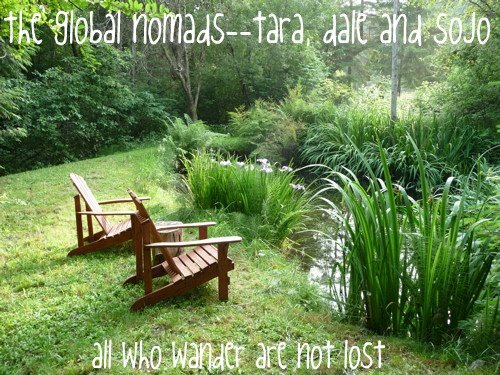 Although, next time, it would be lovely for us to head out of the city itself and explore the countryside. A weekend wish for a car for Gilgamesh was granted by her baba. We then took a family walk together to show off his new wheels to friends in the 'hood. At one point, Sojo said, "You know, it's so nice that we live here where no one says I'm weird for having a car for my stuffed animal." I totally agree. There is an innocence here in our small town that I am not sure exists anymore in many places. As a parent, I love how Sojo does stuff like this and thinks it's absolutely fabulous. I am watching some of the 2nd graders subtly shift into wanting to be with the older kids, and I hope she hangs onto this creative side of imaginative play for as long as she can.